Are you after a pair of cycling headphones? While there are many headphone choices today, not all are suitable for cycling. Using headphones when cycling can be contentious issue that divides cyclists. Some argue that if you’re riding on the road, you need all senses alert to danger. Others argue that music helps you work harder and achieve more so the trade-off is worth it. Everyone is entitled to their opinion. More importantly, you have to know what you’re doing and take all the necessary precautions to minimize the risk of any incidents..
You’ll also need to consider things like size, weight, sweat and water resistance. Taking all these into consideration, here are my top picks for cycling headphones you can consider. The Bose SoundSport is my top pick for value. Considering the quality on offer, the asking price is a steal. The headphones are wireless and feature Bose’s Active EQ technology and awesome sound quality. They use NFC and Bluetooth and offer up to 6 hours of battery life. Construction is delicate but rugged with sweat resistant materials, great fit, Stay Hear+ fitment and the performance you would expect from a product from Bose. Buy If : You’re after a headphone that offers the best value for your money in terms of sound quality and functionalities. The Anker Wireless Headphones are my top pick for those who are budget minded. 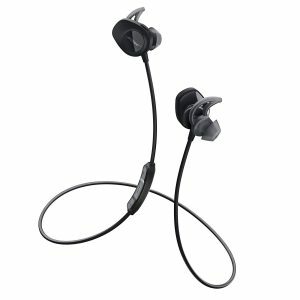 They are wireless, include a microphone, sweat guard material with IPX7 rating, 10mm dynamic drivers for good sound reproduction, 12 hour battery life and a safety cord to keep them attached. The materials and build quality of these headphones are good. They come with over ear loops that are just the right size and the entire setup needs minimal adjustment before use. Buy If : You’re looking for a budget cycling headphones. The Jaybird X3 may have a curious name but they also have fantastic sound quality and they are our top pick for just that reason. These are small earbuds that pack a powerful punch. 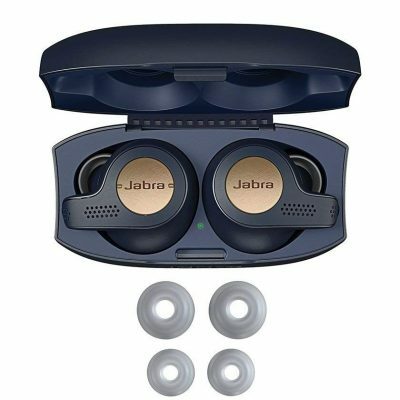 They feature sweatproof materials, silicone housings that lock them in place, wireless operation with up to 8 hours battery life and the MySound app that lets you customize your audio experience. Buy If : You want a headphone that offers the best sound quality while you’re riding. 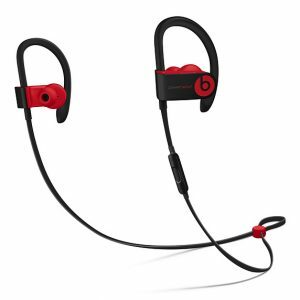 The Beats Powerbeats 3 continues the company’s drive for audio perfection. This model is our pick for best battery life with an average of 12 hours run time per charge. Add a quick charge option that provides an extra hour with only five minutes charging and you have the ideal headphones for cyclists and busy people in general. The build quality is excellent, size and weight more than competitive and they come in different colours too. They are also sweat resistant and four earbud tips to fit every type of ear. Buy If : You’re after a wireless headphone with a long battery life (~12 hours). 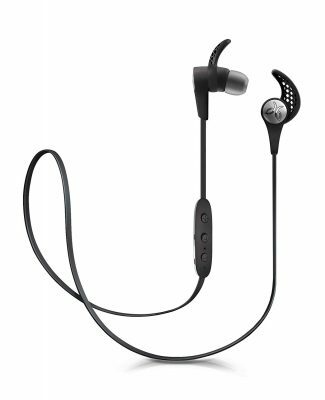 The Bose SoundSport Pulse are different to the SoundSport in that they have a built-in heart rate monitor. If you don’t have a wrist or chest strap, you can minimize weight and device management by using headphones with an HRM built in. These use NFC or Bluetooth and offer up to 5 hours battery life with the HRM running. Build quality is excellent, they come with an IPX4 rating for moisture resistance, a neat carry case and the Bose app to modify audio qualities and other settings. These are top class for audio production and the HRM seems fairly accurate too. Buy If : You want a headphone with a build-in heart rate monitor. The AfterShokz Trekz Air is our top pick for bone conduction headphones. They look a lot different than these earbud style headphones with a much more angular design. They are very comfortable though and are sweat-proof, use Bluetooth and offer up to six hours playback per charge. The construction seems robust and while the neat reflective decals are more style than substance, audio reproduction is where these shine. They leave your ears free to listen for traffic while delivering solid audio performance. Buy If : You want a headphone that allows you to hear your surroundings while riding. The Urbanears Stadion Active is my top pick for situational awareness. 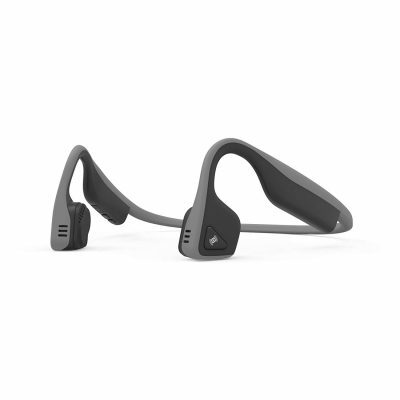 If bone conduction like the Aftershokz Trekz Air isn’t for you, these will be. They are traditional earbuds that project sound well without blocking other sounds going on around you. That’s a definite bonus if you’re cycling in the city. Build quality is good, the headphones are comfortable, will stretch to fit, use Bluetooth and offer up to 7 hours of playback per charge. The design might not be to everybody’s taste but the quality will be. 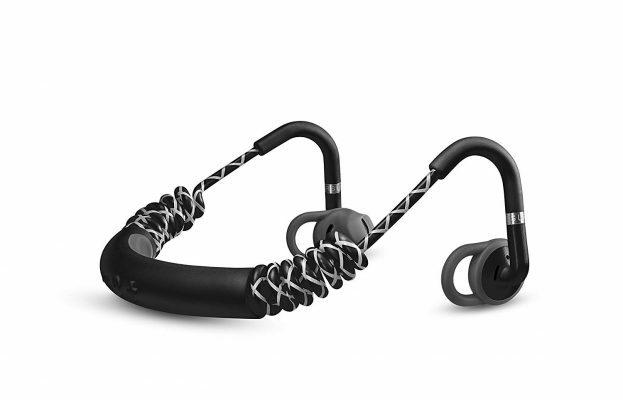 Buy If : This is a good alternative choice to the Aftershokz Trekz Air. The Jabra Elite Active offers great audio quality with the additional benefit of a digital assistant in your ear. They are small earbuds without the security cord, yet shouldn’t fall out of your ears. They sit comfortably inside the ear canal with the grippy material keeping them in place. The material is IP56 rated and includes a motion sensor, accelerometer, and an app to control audio and features. The headphones work with most digital assistants so will work with Alexa, Siri or Google Now. Buy If : You want the best wireless earbuds for cycling. They do look very cool. To be included in this list of the best headphones for cycling, each product had to offer great build quality, fantastic sound reproduction, be sweat resistant and not block too much ambient noise. Road cyclists especially require all their senses to remain safe on the road and these headphones should not impair that safety at all. If you’re in the market for some quality cycling headphones, bear these points in mind when doing your research. Fit and comfort is a key aspect of choosing any kind of headphones. Whether you’re looking at on-ear headphones, earbuds or bone conduction, you want to be able to forget you’re wearing then while enjoying the music. For cycling, wireless is definitely the way to go as wires can restrict your movement and be uncomfortable. All of the headphones featured here should also work with a cycling helmet. While I cannot guarantee a comfortable fit because each of us is different, these headphones will work with a helmet. Sound quality is probably the most important aspect of headphones. The fit, build quality and look are still important but they are all for naught if the audio reproduction in your ear sounds like a pair of Walkman headphones from the eighties. Fortunately, earbuds like the Jabra Elite Active are now capable of impressive quality reproduction and surprisingly good bass. They won’t compare to a set of good quality cans but developments in miniaturization means audio quality is now a million miles from where it used to be. The one compromise you tend to get with earbud headphones is instrument separation. It is sometimes difficult to differentiate between instruments in a piece of music that can occasionally mar the experience. This shouldn’t be an issue while on the road as you will also be hearing ambient noises and will adapt to the reproduction anyway. The inclusion of an app to customize settings and alter the character of the music is a feature in some of these cycling headphones. They give you the chance to tune the audio to your particular taste or to the type of music you’re listening to. Not a prerequisite but it is nice to have. You’re out in the wild or on the road and absolutely must be able to hear what’s going on around you. Earbud design means wind noise should be minimized during your ride. You may still get a little wind whistle but a small adjustment can eliminate wind noise. Of particular note are the bone conduction headphones such as the Aftershokz Trekz Air and the Urbanears Stadion Active. They don’t use your ear at all but your cheek instead. This leaves your ears free to listen for traffic or hazards while still enjoying the music. They don’t suffer from wind noise and can be comfortably placed above, behind or in front of the ear. An ideal solution for reducing wind noise and making sure you’re still in touch with your surroundings. Battery life is the main limitation of wireless headphones but none of the models featured here will leave you wanting. With a minimum of five hours play time as long as you remember to charge them before a ride, they should be enough even for the semi-pro. Some models like the Beats Powerbeats 3 has a play time of up to 12 hours. Most headphones will have USB charging of some kind so if you’re out for longer, you can always carry a USB booster with you. It may be a few grams extra and take up space in your jersey but you never know when you might need it. If you’re listening from your phone, it will likely need a boost too if you’re planning to be out that long! Most of the headphones featured use Bluetooth. Some have NFC options too but predominantly, wireless headphones rely on Bluetooth to receive the music from your phone or portable player. Bluetooth does have a battery drain but that is featured into the battery life. On the upside, Bluetooth is reliable, has decent range, is universal and will work with any Bluetooth certified device. When Bluetooth Low Energy becomes more of a thing, battery drain should be a thing of the past! While you should never answer the phone while riding your bike, Bluetooth connectivity has the advantage of offering voice commands and phone answering capabilities too. If you find yourself in a situation, that could be a lifesaver! Water and sweat resistance may or may not be necessary depending on how much you sweat. We are all different and will sweat at different rates. If you sweat a lot, or even a little, it makes sense to ensure your cycling headphones have some form of moisture protection. Even if you’re not going to get them wet, the climate in your region may have other ideas! Water and sweat resistance is measured using the IP scale. IP stands for Ingress Protection. The numbers will designate the level of protection, as shown in the image above. 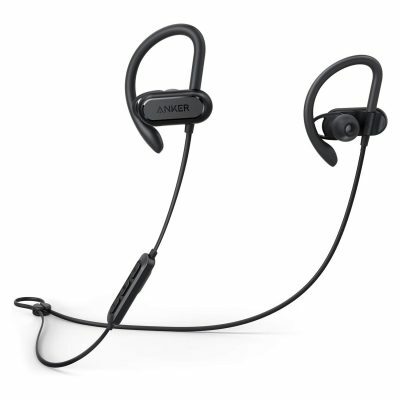 For example, the Anker Wireless Headphones are IPX7 rated. The X means it’s not tested for solids or liquids, while the number 7 means it is safe to immerse in water up to 1m in depth up to 30 mins, maximum. 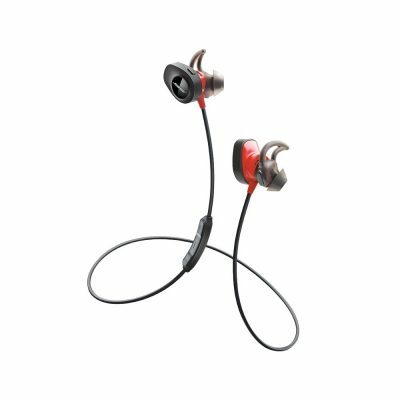 On the other hand, the Jabra Elite Active are IP56 certified. 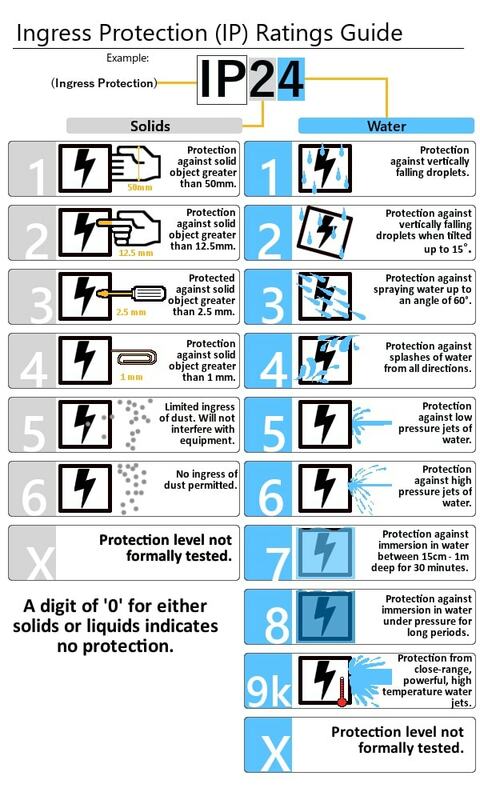 The 5 means it’s has protection against dust ingress and the 6 means safe against powerful water jets. Bone conduction is a relatively new way to conduct audio. Rather than sit on or in your ear, bone conduction headphones will sit on your cheek or skull. This leaves your ears free to take in the world around you and is also very comfortable when you get used to them. One such example is the Aftershokz Trekz Air. There is no ear rub, no chafing in the ear canal, no soreness after prolonged use and no discomfort from sweat either. Bone conduction uses an open ear design and transmits audio waves through your bone instead of sending it into the eardrum. It is just as effective as in-ear headphones and has the benefit of letting you remain aware of the world around you. Typical warranties for headphones stand at one or two years. I’m always of the believe that if you buy quality products, you should never need the warranty but it’s nice to have one anyway. The warranty will usually protect the headphones themselves but not any silicon covers or accessories.